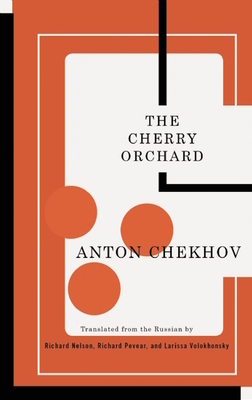 The Cherry Orchard (Tcg Classic Russian Drama) (Paperback) | The Drama Book Shop, Inc. There have always been two versions of Chekhov's heartrending and humorous masterwork: the one with which we are all familiar, staged by Konstatine Stanislavski at the Moscow Art Theatre in 1904, and the one Chekhov had originally envisioned. Now, for the first time, both are available and published here in a single volume in translations by the renowned playwright Richard Nelson and Richard Peavar and Larissa Volokhonsky, the foremost contemporary translators of classic Russian literature. Shedding new light on this most revered play, the translators reconstructed the script Chekhov first submitted and all of the changes he made prior to rehearsal. The result is a major event in the publishing of Chekhov's canon. Richard Nelson's many plays include Rodney's Wife, Goodnight Children Everywhere, Drama Desk-nominated Franny's Way and Some Americans Abroad, Tony Award-nominated Two Shakespearean Actors and James Joyce's The Dead (with Shaun Davey), for which he won a Tony Award for Best Book of a Musical, and the critically acclaimed, searing play cycle, The Apple Family Plays. Richard Pevear and Larissa Volokhonsky have produced acclaimed translations of Leo Tolstoy, Fyodor Dostoevsky, Nikolai Gogol, Anton Chekhov, and Mikhail Bulgakov. Their translations of The Brothers Karamazov and Anna Karenina won the 1991 and 2002 PEN/Book-of-the-Month Club Translation Prizes. Pevvear, a native of Boston, and Volokhonsjky, of St. Petersburg, are married to each other and live in Paris. Richard Nelson's many plays include Rodney's Wife, Goodnight Children Everywhere, Drama Desk-nominated Franny's Way and Some Americans Abroad, Tony Award-nominated Two Shakespearean Actors, and James Joyce's The Dead (with Shaun Davey), for which he won a Tony Award for Best Book of a Musical, and the acclaimed Apple Family Plays, a quartet of plays that include That Hopey Changey Thing, Sweet and Sad, Sorry and Regular Singing. Richard Pevear and Larissa Volokhonsky have produced acclaimed translations of Leo Tolstoy, Fyodor Dostoevsky, Nikolai Gogol, Anton Chekhov and Mikhail Bulgakov. Their translations of The Brothers Karamazov and Anna Karenina won the 1991 and 2002 PEN/Book-of-the-Month Club Translation Prizes. Pevear, a native of Boston, and Volokhonsky, of St. Petersburg, are married to each other and live in Paris.